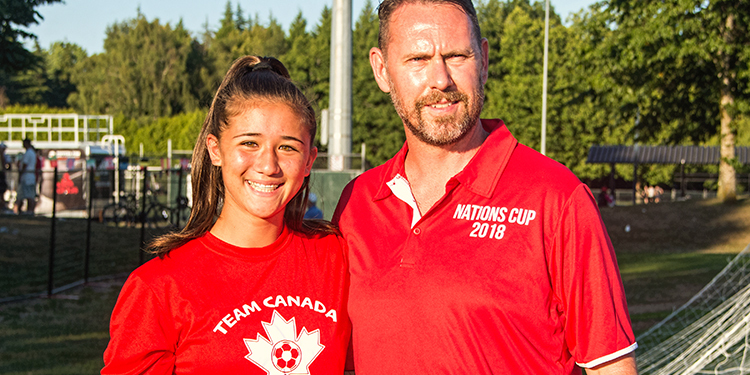 Richmond's Dakota Chan (receiving the MVP award from Nations Cup president Jeff Wilson) stood tall for Canada, scoring a goal and setting up another in a 3-1 win over Ireland Sunday in the Women's Division final at the Nations Cup soccer tournament. Dakota Chan has always shown an ability to step up in the biggest moments. It was no exception in the Nations Cup soccer tournament last weekend at Hugh Boyd Park. A talented multi-sport athlete who later this summer will make her debut at the University of Nebraska on a soccer scholarship, the recent McMath secondary graduate subbed into the final Women’s Division match to start the second half Sunday. Her presence clearly change the momentum, as she promptly scored once and set up another to power Canada past defending champion Ireland 3-1. Well deserved, the always hard-working Chan was selected as the tournament’s most valuable player although it was a “total surprise” to her given the great many female players in the event. Chan has been training diligently on her own for last five weeks in preparation for her freshman season at Nebraska. She has particularly focused on her fitness, running her heart out at the McMath field with hour-long workouts. She’s also been swimming as much as possible with the Richmond Kigoos. The workouts are paying dividends, as Chan said she didn’t at all tired during the Nations Cup and easily recovered from any hard running she had to do. Canada didn’t allow a goal against in its first three tournament games, blanking Africa in its opener 2-0 Friday before edging England 1-0 Saturday morning and playing to a scoreless draw against the United States Sunday morning.